posted by Billie Owens in news, business, united way of genesee county. Today, the United Way of Genesee County’s Board of Directors announced that Erik Fix has resigned his position as Executive Director effective later this month. Fix served the county in this capacity for six years. United Way of Genesee County’s Board of Directors will continue its mission to motivate and organize people as it begins a search, in partnership with United Way of Greater Rochester, to fill the Executive Director position. The organization is excited to kick off its 2018 campaign at the end of this month with the women of the United Way of Genesee County Board of Directors as chairpersons of the campaign. “We have always been a very active board, and this provides another opportunity for us to make a difference for this community,” DeMars said. For more information about United Way of Genesee County’s Executive Director position, visit uwrochester.org/our-team. For more information about the United Way of Genesee County or, if you are interested in giving, volunteering or advocating for the organization, visit uwgeneseecounty.org. posted by Howard B. Owens in O-AT-KA Milk Products, batavia, business, news. O-AT-KA Milk Products, of Batavia, is proud to announce the completion of its recent 20,000- square-foot building expansion. The walls are up and the equipment is installed, but the most important piece – the people – is the final stage of the project. The expansion, nicknamed Project Gator, is the third of its kind in the past six years and will boost O-AT-KA’s current workforce of 440 employees, as promised during the planning phase. Support from local municipalities, the Genesee County Economic Development Center and Empire State Development made the expansion a reality. “I am so pleased to see a great hometown company like O-AT-KA continue to grow, thrive and add 40 new jobs to be filled by local residents," said Assemblyman Steve Hawley (R,C,I-Batavia). "Our area is primed for growth and it makes us a stronger community to witness a commitment like this from a great homegrown company like O-AT-KA. The expansion has significantly expanded O-AT-KA’s beverage capabilities and ability to meet growing customer demand. Production and packaging lines are currently undergoing thorough quality testing before full production starts early this fall. “The work we do matters," said CEO Bill Schreiber. "We partner with our customers to create unique products while adding value to local milk. The ongoing efforts of our team have resulted in sustained growth and investment for the business, while supporting our dairy farmer owners and creating a rewarding work environment for our employees. Hiring has begun, with the intention to fill 40 additional jobs immediately. "We’ve grown by more than 150 team members since 2015. We plan to hire and train an additional 40 individuals," said Donna Maxwell, VP of Human Resources. “The work we do here serves our farmer-owners and supports local agriculture. We’re looking for people with a farmer’s work ethic; people who take pride in their work. posted by Billie Owens in business, news, notify, uber. Uber today announced that Batavia native Rebecca Messina will join the company’s executive leadership team as global Chief Marketing Officer. As Uber’s first-ever CMO, Messina will bring together Uber’s marketing teams around the world, building a global marketing organization that can support the company’s growth going forward. 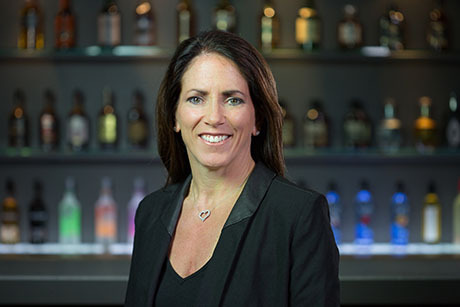 Messina joins Uber from Beam Suntory, the world's third largest premium spirits company, where she has served as global Chief Marketing Officer since 2016. Prior to Beam Suntory, she spent 22 years at The Coca-Cola Company, where she most recently served as Senior Vice President, Marketing & Innovation for Ventures & Emerging Brands. Previously she served in a number of different marketing leadership roles across the company, both in the United States and internationally. Messina currently serves on the boards of the Mobile Marketing Association (MMA) and the Ad Council, and has also served on the National Board of Directors of the American Marketing Association (AMA), the Georgia State Marketing Roundtable and the Atlanta Executive Board of the AMA. She holds a bachelor’s degree from Miami University (Oxford, Ohio). The Batavia High School alumna speaks English, Spanish, Italian and French. She is married, with two children, and currently lives in Chicago. posted by Billie Owens in news, tourism, genesee county, business. The Genesee County Chamber of Commerce’s tourism program has partnered with Channel 13-WHAM to create a featured promotion that will air on FOX, The CW, and ABC. The 30-minute show, called "It's Closer than You Think," is a sampling of what’s new in Genesee County, along with some of the county’s best outdoor recreational opportunities. It debuts tomorrow morning at 7. “The promotion is designed to raise awareness to Rochester area residents that Genesee County is just a short drive that offers great 'close to home' recreation, dining and shopping options,” said Kelly Rapone, Tourism Marketing director for the Genesee County Chamber of Commerce. “We’d like to do another future episode that highlights even more of the county’s treasures." Be sure to tune in to see special interviews with some of our local tourism businesses in Le Roy and Batavia, as well as outdoor recreation hot spots across the county. Over the spring and summer, we also included commercials under this theme that highlighted concerts, Batavia Muckdogs home games, golf packages, racing at Genesee Speedway, the Oatka Festival, as well as The Ramble Music & Arts Festival. posted by Howard B. Owens in GCEDC, batavia, business, news, Jim Krencik. 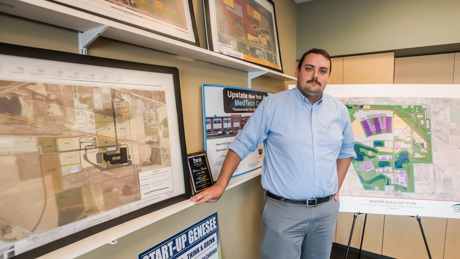 During his eight-year journalism career, Jim Krencik covered economic development in Orleans County and Genesee County, and has often happens with a lot of reporters, he took a keen interest in the topic he was covering. A week ago, he left his job at the Batavia Daily News and went to work for the Genesee County Economic Development Center as the new director of marketing and communications. 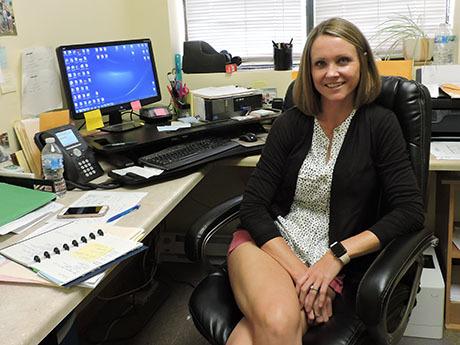 He replaces Rachael Tabelski, who is now director of the Batavia Development Corp.
"I started to cover the GCEDC and explaining the big projects and how deals come together, what's happening in our community, that was just really spurred an interest," Krencik said. "I've always been impressed by the work they do here. I think their vision is outstanding and I want to help that mission however I can in this role." Krenick left the Daily News after five and a half years as a hard-working reporter covering local government, mostly, in Genesee County for a job that will pay him $47,000 a year, which is substantially more than a typical reporter makes at a small-circulation paper. 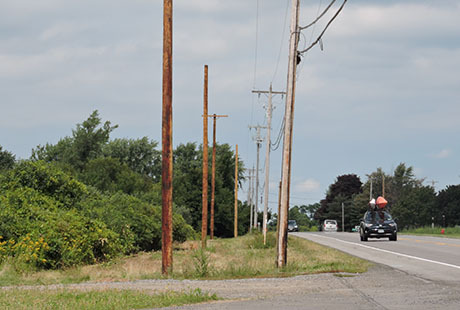 "It was just very interesting looking at the variety of sites that we have here in Genesee County," Krenick said. "It's interesting looking at the number of businesses that are coming in and thinking if I could do something to help, that's beneficial to the whole community. It is wonderful to not only to share that with the public, but to help the team make that happen; that is very attractive." posted by Billie Owens in Announcements, business, Blue Pearl Yoga, EnTranced. Glenn Adams will introduce his business EnTranced to area residents in upcoming seminars. Hypnosis has proven successful in helping people change habits from anxiety to smoking. Likewise, it often helps with sleep disorders, pain management, and lots of things in-between. To introduce the benefits of hypnosis to the broader public, Adams will be giving introductory talks hosted by Blue Pearl Yoga, on the fourth floor of the Masonic Temple in Downtown Batavia. One is tomorrow, Sept. 8, from 12:30 to 1:30 p.m.; and two are on Tuesday, Sept. 11, in the morning from 10 to 11 and in the evening from 6:30 to 7:30. Cost is $5. Sign up on the Blue Pearl Yoga website, bp-yoga.com -- click on Events & Workshops -- using PayPal. Adams can be reached at 585-727-4408. People often ask how I got into hypnosis. I have relatives and friends who had problems the medical community couldn’t treat adequately, or even diagnose in some cases. When my son-in-law was ready to file for total disability, I figured there must be a different approach for some of the issues. I ended up going the direction of hypnosis and have never looked back. Are there things hypnosis cannot help? I don’t really know the limits of the human mind. Remember that our 50 trillion cells all develop from one cell. But I do have a client with restless leg syndrome and we haven’t resolved it, at least not yet. Can hypnosis make people do things they don't want to do? Hypnosis is really an educational process, which makes it easier people to do what they really want to do. It doesn’t make them do what they don’t want to do. Unfortunately, we are not born with a users manual for the mind so we just work to use it more strategically. Cheryl and I moved into the Batavia area in 1985. Since then we have been involved in a number of church and civic activities. I am semi-retired after teaching at Spencerport High School and Roberts Wesleyan College, and also run a Registered Investment Advisory business. posted by Howard B. Owens in GGLDC, GCEDC, Rest & Revival Float Center, batavia, business. The Genesee Gateway Local Development Corporation (GGLDC) today approved a loan for Rest & Revival Float Center LLC’s renovation of a City of Batavia facility. The startup company will be the first health and wellness center in Batavia and Genesee County to provide floatation therapy services. The renovation includes the purchase of new machinery and equipment. The project has a capital investment of $355,000 and will retain two jobs and create three new jobs. The company will receive a $100,000 loan from the Genesee Gateway Local Development Corporation’s Revolving Loan Fund. Rest & Revive will provide floatation therapy and retail sales of floatation sleep therapy systems. posted by Howard B. Owens in GCEDC, darien lake, darien lake theme park, business, Amada Tool. The Genesee County Economic Development Center (GCEDC) approved applications for incentives for two capital projects at the agency’s Sept. 6th board meeting. Amada Tool in the city of Batavia is planning an $8.8 million capital investment to increase the company’s manufacturing facility by approximately 19,000 square feet in the City of Batavia. The project would create 17 new jobs and retain 68 current jobs. The proposed investment includes $2.3 million in construction costs and $6.5 million in new equipment. Amada Tool is seeking property and sales tax exemptions of approximately $266,000. Approximately $85 will be generated in the regional economy for every one dollar of private-sector investment by Amada. Six Flags Darien Lake LLC is one of the largest sales tax revenue generators in Genesee County and one of the region’s most popular tourist destinations is planning to build and open a new $2.150 million ride in 2019. The company is seeking approximately $166,000 in sales tax exemptions. Both projects will require public hearings as the companies are seeking incentives of more than $100,000. posted by Howard B. Owens in real estate, business, news. According to Ellie Mae Millennial Tracker, 77 percent of Millennials who bought homes in July where single. That's the fourth highest total in the nation, according to the tracker. Lynn Bezon, co-owner of Reliant Realty, said that percentage may be masking a trend she sees: Which is for only one member of a Millennial couple to take out the mortgage to buy the house. "One person in the couple may not be creditworthy or not have the income (to qualify)," Bezon said. Sometimes, the couple isn't married and a parent has recommended only the person who has the means to make the purchase take out the loan. "I don't get a lot of single Millennial buyers," she said. Millennials are generally considered to be people born in the early 1980s through the mid-1990s, so some Millennials are now in their 30s, and that's the age where more single Millennials will buy a house, she said, though it's still not common. A common reason one person in a couple might not qualify for a loan yet is the other person weighted down by college debt. That is also the number one reason Millennials don't buy homes at all, she said. Sometimes they have to wait for the right job to come along that pays them enough to diminish the negative effect of student loans on credit applications. posted by Billie Owens in business, batavia, chamber of commerce, news. The Genesee County Chamber of Commerce's Annual Awards Committee announced today that the ceremony for 2018 honorees will be held on Saturday, March 2. It will take place at The Quality Inn & Suites, Park Road, Batavia (formerly The Clarion Hotel). Nominations are now being accepted for: Business of the Year; Entrepreneurial Business of the Year; Agricultural Business of the Year; Innovative Enterprise of the Year; Special Service Recognition; and Geneseeans of the Year. Nominations MUST BE RECEIVED BY Dec. 28 to be eligible for consideration. posted by Virginia Kropf in L & L Transmission, batavia, business, news. Leon Selapack learned early on the meaning of work, and the values he learned from his father he has tried to pass on to his children. Cameron Selapack and his sister Danielle are taking over L & L Transmission, the business founded 40 years ago by their parents Leon and Lee Ann. Leon grew up in Buffalo and started working for his father in the construction business when he was very young. As that business was seasonal, he got a job at a transmission shop in Williamsville when he was only 15 or 16. When he and his first wife bought land on Colby Road, Leon realized there was not a transmission shop in the Genesee County area. He established L & L Transmission with one bay in an old Kendall gas station at the corner of Liberty and Ellicott Street, across from the Pok-A-Dot. He hired George Stiles, who still works for L & L today. Nearly two years later, urban renewal came along and he had to move. He bought a lot on Pearl Street and put up a shop there, where Brian King began cleaning floors at the age of 15. King is also still employed at the business. His business continued to grow and he even transformed his barn at home and had three men rebuilding trannies there, Leon said. L & L moved again to a larger facility on Hutchins Street, where they operated from 1990 to 1997. 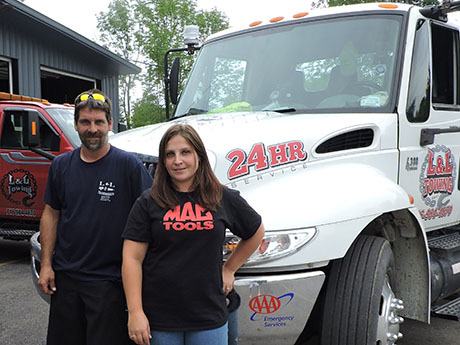 When Lee and Charles Houseknecht decided to retire in 1997 and sell their 75-year-old truck repair shop on Alexander Road, the Selapacks bought it, where today the five bays and nine employees are always busy (not counting Cameron, Danielle and Leon). Like their father, Cameron and Danielle starting helping Leon at a young age. Cameron was 12 when he began pulling transmissions apart and cleaning the shop, Leon said. Danielle has been there 11 years, having started as a secretary out of college. As for Leon, he and his second wife, Susan, have a 13-year-old son, Dalton, who is already learning the mechanical side of the business, as well as helping Leon on his farm. “He’s not playing video games all the time,” Leon said. While Leon still does the transmission work on old cars, he is scaling back a little from the shop, opting to spend more time farming, a passion he has always had. He also likes to hunt and fish, but still keeps a finger in the business. “I had a leg injury two years ago and decided to start relinquishing some of the duties to the kids,” Leon said. Since starting to take over L & L, Cameron started up the towing business again. Both he and Danielle say they value the business ethics their parents instilled in them. Their mother told them they might not make as much money, but they could sleep at night. L & L hasn’t planned any special celebrations for their 40th anniversary – just to keep serving their customers as usual. Leon said if he had one thing to say, it would be to thank all the customers who have supported them during the years – from Western New York and the Finger Lakes to Pennsylvania and Canada. L & L has been a community supporter during its years in business, by sponsoring races at Genesee and Canandaigua raceways, donating to local fundraisers and sponsoring local events. 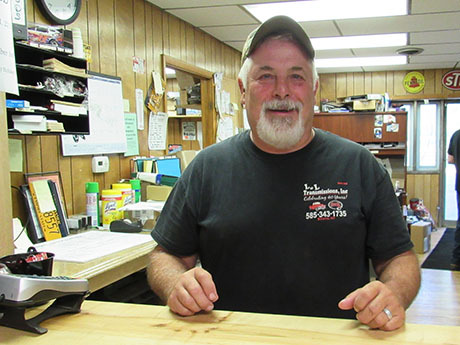 Top photo: Leon Selapack, who started L & L Transmission 40 years ago, stands at the counter of the shop, which is now located on Alexander Road, Batavia, in the building which formerly housed Houseknecht Motors. Photos by Virginia Kropf. Cameron Selapack and his sister Danielle stand in front of one of their tow trucks at L & L Transmission on Alexander Road (Route 98), Batavia. The business, started by their father Leon and mother Lee Ann, is observing its 40th anniversary this year. posted by Billie Owens in news, GCEDC, business, Darien, batavia, Amada Tool, Six Flags Darien Lake. 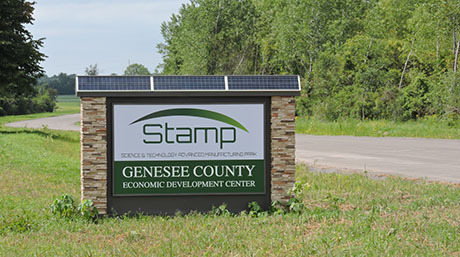 The Genesee County Economic Development Center (GCEDC) will consider accepting applications for incentives for two capital projects at the agency’s Sept. 6th board meeting. Amada Tool in the City of Batavia is seeking incentives for an $8.8 million capital investment to increase the company’s manufacturing facility by approximately 19,000 square feet. The project would create 17 new jobs and retain 68 current jobs. The proposed investment includes $2.3 million in construction costs and $6.5 million in new equipment. Amada Tool is seeking property and sales tax exemptions of approximately $266,000. Six Flags Darien Lake LLC is seeking approximately $166,000 in sales tax exemption to build a new $2.150 million ride that is scheduled to open in 2019. Six Flags Darien Lake LLC is one of the largest sales tax revenue generator in Genesee County and one of the region’s most popular tourism destinations. The board meeting begins at 4 p.m. and is open to the public. It will be held at the GCEDC, 99 MedTech Drive in Batavia. posted by Billie Owens in clean energy, education, business, news. Governor Andrew M. Cuomo today announced $15 million is available to fund two initiatives that will promote clean energy workforce development and training programs on SUNY campuses. Nearly $6 million was awarded to SUNY campuses to train more workers in the clean energy sector. In addition, a request for proposals was made available to all SUNY campuses for grants totaling $9 million to provide apprenticeships, internships, and educational programs and support through industry partnerships across the state. These initiatives are part of Climate Jobs NY, a component of Clean Climate Careers initiative. "As the federal government moves further away from responsible energy policy and clean energy production, New York is committed to fighting climate change and protecting our environment," Governor Cuomo said. "We will continue to take bold action to promote clean energy across the state and support job growth in cutting-edge, renewable industries." "Funding for clean energy and workforce development programs at SUNY campuses across the state will help to promote environmental protection," said Lieutenant Governor Kathy Hochul, who delivered today's announcement. "Unlike the federal government, New York is advancing ambitious clean energy goals to address the important issue of climate change. These training programs will continue to support the industry and prepare individuals for jobs of the future." As part of the $9 million RFP for additional grants, the SUNY university system will explore opportunities for partnerships with state and local agencies, including the Department of Labor, the New York State Energy Research and Development Authority, Empire State Development, and Industrial Development Agencies. These partnerships will aim to meet existing and emerging critical workforce needs of New York's clean energy industry, drive regional economic development, and provide hands-on learning to students. Up to $1 million of the RFP is allocated specifically for Community College Regional Council awards to develop events and workshops that will facilitate partnerships between clean energy industry players and SUNY community colleges in the region, share best practices amongst community colleges on curricula materials and tools to accelerate the pace of clean energy workforce development, and plan regional strategies to promote a culture of environmental sustainability. SUNY Chancellor Kristina M. Johnson said, "The alarms have sounded again and again on the consequences of climate change, overdependence on fossil fuels, and increased energy use and costs. SUNY is proud to provide high-quality, hands-on, and the most up-to-date clean energy education and training to our students, building a diverse, preeminent talent pipeline for today and tomorrow's clean energy industry in New York State. We are proud to be a part of the governor's long-term energy solution." Department of Labor Commissioner Roberta Reardon said, "The lack of clean energy leadership at the federal level could threaten opportunities for New Yorkers, so I commend Governor Cuomo's commitment to ensuring that workforce development in green industries is a priority. The Department of Labor stands ready to support this innovative initiative that will benefit workers and businesses alike." Empire State Development President, CEO and Commissioner Howard Zemsky said, "Workforce training and development programs are crucial to the economic growth and sustainability of New York State. These funds will ensure that New York is generating trained employees for a growing industry, while furthering the Governor's commitment to clean energy." Richard Kauffman, Chair of Energy and Finance for New York State said, "Under Governor Cuomo's leadership, New York continues to make significant investments in projects and initiatives that reduce the state's carbon footprint, ensure strong employment growth, and support our growing clean energy economy. Investing in workforce development and training programs on SUNY campuses will help prepare our next generation of clean energy workers to meet the workforce demands of an expanding and innovative job market." Alicia Barton, President and CEO, NYSERDA said, "As New York continues to lead the nation in its commitment to renewable energy and its fight against climate change, we need to work collaboratively with colleges and universities, as well as the business community, to best prepare students and workers for growing job opportunities in the clean energy sector. Today's announcement is another example of Governor Cuomo putting the well-being of all New Yorkers first by investing in strategic initiatives that support the state's ambitious clean energy goals." Frederick E. Kowal, Ph.D., president of United University Professions, said, "We applaud the governor for embracing the crucial role of education and training in developing and expanding a clean energy workforce in New York state. UUP stands with the governor and SUNY in making New York a green energy leader, in the U.S. and worldwide." Binghamton University will establish a Clean Energy Undergraduate Research Program within its Freshman Research Immersion program. The new clean energy program will provide a summer component, including research fellowships for under-represented minority students and internships with clean energy companies. Buffalo State College will develop clean energy certificate programs in partnership with the New York Power Authority. The certificates will also earn students credits toward an associate or bachelor's degree. University at Buffalo will develop a Western New York Clean Energy Workforce Development program to include a certification and micro-credentialing, which may take the form of digital badges or other micro-awards—to both meet business and industry expectations and motivate and prepare well-rounded students with highly marketable skills. SUNY Canton will enhance its Solar Ready Vets program on site at Fort Drum. The training provides a micro-credential program in renewable energy specifically for veterans transitioning to civilian life. Erie Community College will enhance its non-credit continuing education units for architects and engineers, as well as building and code inspectors, by including electrical/photovoltaic solar updates for curricula design. Farmingdale State College will develop certificate and fast track training programs within its Renewable Energy and Sustainability Center to meet emerging needs of the clean energy industry. The Renewable Energy and Sustainability Center will partner with local industry to identify short- and long-term needs. SUNY Maritime will receive funding for two programs. The first, through its Off-Shore Energy Center, will develop a wind operations technician training program, as well as dynamic positioning training and certification courses for off-shore vessel operators. The second will develop a certification in partnership with the liquid natural gas industry. Coursework from the program will also be incorporated into licensing programs for licensed mariners. Nassau Community College will develop new curriculum to include Energy Industry Fundamentals certificates. SUNY Oswego will develop and enhance the campus's energy laboratories to support the curriculum of multiple departments. The campus will also expand research and applied learning opportunities and strengthen collaboration and student transfer between SUNY Oswego and Onondaga Community College. SUNY Polytechnic Institute will partner with SUNY College of Environmental Science and Forestry and SUNY Oneonta to offer experiential learning opportunities for students to apply green building principles by Leadership in Energy and Environmental Design certifying SUNY campus buildings. LEED Accredited Professionals will engage undergraduate students in the LEED Existing Buildings Operations and Maintenance certification process and the LEED for Building Design and Construction via experiential learning projects tied to new courses. posted by Billie Owens in business, Bed Bath & Beyond, batavia, news, notify. 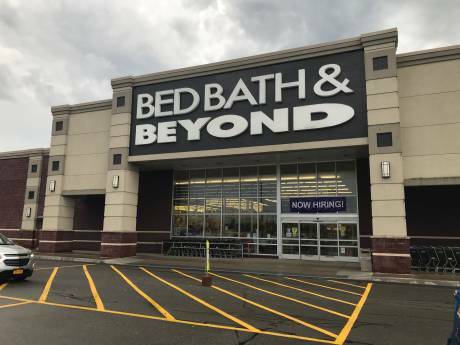 The store manager at Bed Bath & Beyond in Towne Center at Batavia confirmed this afternoon that the store is closing, but says there is no firm date yet. The store's lease with mall owner COR Development Co. LLC expired, and either more favorable terms could not be negotiated or the decision was made to outright pull the plug on the store once the current lease expired. The closure is not altogether unexpected given slumping stock performance for the New Jersey-based chain of home-goods stores, hard hit by online sales competition. According to market analysts, BBB stock has declined 55 percent in the last year and 74 percent in the last five years. The company is still profitable, but financial experts say it is not closing brick-and-mortar stores fast enough to continue competing online. Company executives in 2018 forecasts talked of closing more than three dozen locations nationwide, while opening more Buy, Buy Baby and Cost Plus World Market stores, which are also owned by the parent company. Analysts say a big issue for BBB is that it stocks a lot of nationally branded commodity items that can be found elsewhere, like Amazon, for less, even with BBB's ubiquitous 20-percent off coupons and oftentimes free shipping. What has long been a strong suit of Bed, Bath & Beyond, its peerless in-store customer service -- on par with the likes of world-class Nordstrom -- will be missed by many shoppers who experienced it firsthand. Never say the word "no" (find a solution that satifies the customer). posted by Billie Owens in business, news, Tops. Tops Markets LLC (“Tops” or the “Company”) today (Aug. 31) announced that it has filed a Plan of Reorganization (the "Plan") and a related Disclosure Statement with the United States Bankruptcy Court for the Southern District of New York. The Plan incorporates the Company’s court-approved agreements with its unions and is supported by certain of the company's senior secured lenders that hold more than 87 percent of its Senior Secured Notes due 2022. Curci added, "We thank our employees for maintaining our high quality of customer service and dedication to Tops, as well as our loyal customers, suppliers and other stakeholders for their support as we progress through this process." A hearing to consider approval of the Disclosure Statement is scheduled for Sept. 27. Following approval of the Disclosure Statement, the company intends to seek confirmation of the Plan on Nov. 8. Additional information is available on Tops’ restructuring website at www.topsrestructuring.com or by calling Tops’ Restructuring Hotline, toll-free in the United States, at (888) 764-7358. For calls originating outside of the United States, please dial (503) 520-4457. Court documents and additional information can be found at a website administrated by the Company’s claims agent, Epiq, at http://dm.epiq11.com/TOPS. Weil, Gotshal & Manges LLP is serving as legal counsel to Tops, Evercore is serving as Investment Banker and FTI Consulting, Inc. is serving as restructuring advisor. Tops Markets, LLC, is headquartered in Williamsville and operates 169 full-service supermarkets with five additional by franchisees under the Tops Markets banner. Tops employs over 14,000 associates and is a leading full-service grocery retailer in Upstate New York, Northern Pennsylvania, and Vermont. For more information about Tops Markets, visit the company's website at www.topsmarkets.com. posted by Virginia Kropf in Darien, business, news. Editor's Note Aug. 31, 4:45 p.m.: The Kickstarter link was broken and was replaced with a new, correct one. Penny is a lifelong quilter, who has won awards for her quilting patterns. Until recently, they traveled the Eastern United States attending quilt shows. She ships her patterns all over the United States and five countries. Charlie is a sewing machine repair technician for a company in Depew, whose owner has decided to close the business, and has offered it to the Marbles. In order to take on the new business, the Marbles must complete a studio they had built in 2016 by Amish friends. While the Amish put up the shell, it was the Marble’s intention to finish the inside themselves. Then Penny got sick last year and was hospitalized. At first doctors thought it was just exhaustion, but after many tests, she was diagnosed with System Exertion Intolerance Disorder, a serious form of chronic fatigue. It meant they must put their dreams of a new studio on hold. “It broke my heart,” Penny said. Now the couple has to complete enough of the inside of the studio in order to take on the sewing machine repair business. To do this, they need to raise $5,000 for materials and have launched a Kickstarter campaign. The Marbles will also be taking over classes on embroidery, sewing and quilting, which have been offered at the Depew shop. They will also become an authorized Brother (sewing machine) Service Center. “It is a priority now to finish our building,” Penny said. Pledges to their Kickstarter campaign will help them finish the interior of the studio, purchase tables, chairs, and electronics for the classroom and install a kitchenette so visitors can have a cup of coffee. Readers can help the Marbles achieve their dream by logging on to: www.kickstarter.com/projects/pmqdthestitchery/the-studio-2 to make a pledge. Pledges start at only $5 and Penny is offering rewards for donations, which include: having the donor’s name permanently written on a 2 x 4 or drywall; discounts on future orders; a personalized mug rug; free classes at the studio; and, for a $50 donation, a 1 foot by 1 foot barn quilt or an award ribbon pillow. Pledges of $100 or more will entitle the donor to: $100 off any long-arm quilting project; or two weeks of maker space rental, in which an artisan may set up a booth with their wares and use the classroom for workshops. Other awards for larger donations include a personalized baby quilt, a T-shirt/ memory quilt, and larger barn quilts. The Marbles already have instructors lined up for various classes. Charlie and the second sewing machine technician come with years of experience and are qualified to service and repair any make, model or age sewing machine. “This is going to be a fun place once it’s up and running,” Penny said. Their target date to open is Dec. 1. 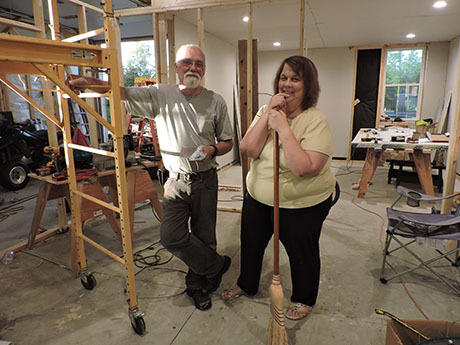 Photo: Charlie and Penny Marble, of Darien, stand amid construction in a shop they are trying to complete in order to take on the business from a Depew sewing machine repair shop which is closing. The couple has launched a Kickstarter campaign in an effort to raise $5,000 by Oct. 3. Photo by Virginia Kropf. posted by Virginia Kropf in Country Line Electric, batavia, news, business. 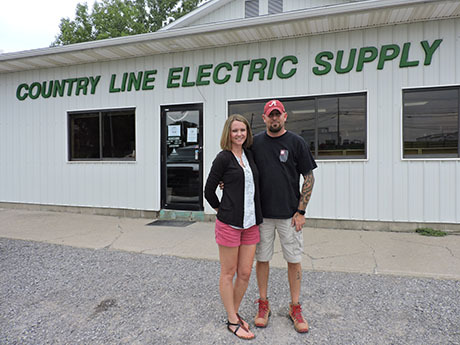 Country Line Electric Supply is a true family business, said Sarah Rosenbeck, who with her brother William “Billy” Massett III has been involved in the company since they were young. In April, the company reached its 40th anniversary and they are spending the rest of the year celebrating. Rosenbeck, who works in the Batavia location with her husband, Justin, handles the office managerial duties, while Billy, who works in the Silver Springs shop, takes care of product line and knowledge. His wife, Jen, is office manager there. The Rosenbecks have three children and the Massetts have two. Country Line Electric was founded to fill a void in the business community, Rosenbeck said. Her father grew up in West Seneca, where he worked installing elevators. While doing side jobs with his grandfather, many of them in the Genesee/Wyoming County area, William realized there was no electrical supply company nearby. William was familiar with Silver Springs, having visited Silver Lake growing up. He first opened his business in Silver Springs, which remains the main headquarters. He purchased the old Silver Springs school when it merged with Letchworth Central, and 30 years ago moved into Batavia, opening a business just west of their current location at 5059 E. Main. Rosenbeck and her brother took over in 2015, but their father remains on the board, she said. Country Line Electric sells commercial products for the heating, plumbing, ventilation, cooling and waste industries, as well as serving residential customers. Agriculture is a large part of their business, also, Rosenbeck said. The company continues to grow and currently has several job openings at its Silver Lake location. They are currently near the end of a two-year process to become certified as a “woman-owned business” in New York State. “This certification will open more doors for us, and allow us to work more on the municipal level,” Rosenbeck explained. They are also looking to put on another addition, she said. The company has been celebrating since April by offering free hot dogs to customers on “Hot Dog Wednesday," handing out free tee shirts and sponsoring several contest giveaways on Facebook. Top photo: Sarah Rosenbeck and her husband, Justin, stand in front of Country Line Electric Supply on East Main Street, Batavia, the company founded 40 years ago in Silver Springs by her father, William Massett. Sarah Rosenbeck is the daughter of William Massett, who started Country Line Electric Supply in 1978 in Silver Springs. She and her brother William Massett III “Billy” now run the company, which is celebrating its 40th anniversary. Rosenbeck works in the Batavia location with her husband, Justin, while Billy mans the Silver Springs store with his wife, Jen. Photos by Virginia Kropf. posted by Howard B. Owens in agriculture, business, New York Farm Bureau. New York Farm Bureau, along with the New York State Department of Agriculture and Markets Commissioner, Richard Ball, and Farmers for Free Trade, highlighted today the importance of open markets for the state’s farmers and encouraged a quick end to the trade war that is creating an economic hardship on family farms across New York. The farmers gathered at the Great New York State Fair, an important celebration of New York agriculture, to discuss their concerns. A number of New York commodities, including dairy, soybeans, wine, maple and apples face retaliatory tariffs in several countries including China, Canada, Mexico and in the European Union. In turn, commodity prices have fallen on agricultural products. Equipment prices are rising due to the steel and aluminum tariffs, and farmers are concerned about losing long-established markets as countries turn to other, cheaper sources for their food. These losses, in turn, will impact rural communities that depend on agriculture to support their local economies. While U.S. agriculture has had a trade surplus, the farm economy has not been a bright spot for this country. Net farm income was already down by 50 percent before the trade wars began. When times are tough, this is when this country needs to be looking for new opportunities to expand markets to sell the quality products produced on our farms. The principle agreement announced this week with Mexico is a positive step in the right direction, but ultimately, we will need Canada to complete an effective NAFTA deal. Farmers also encouraged a resolution to disputes elsewhere, including China. “Since the end of May, following Mexico’s announcement of 25 percent retaliatory tariffs on U.S. cheeses, the price we receive for our milk has dropped by 14 percent. To put that into realistic terms for our dairy farm, that is a loss of more than $3,000 a day. Farm families like mine and our dairy farming friends across New York State are asking for a quick end to the trade war affecting our families’ livelihoods and our country’s backbone, the American farmer,” said Johanna Fox-Bossard, Barbland Dairy in Fabius. “New York maple producers are concerned about trade from two fronts. The tariffs in both Asia and Canada mean a potential loss of markets for American made maple syrup as cheaper Canadian maple syrup moves in to fill the void. In addition, the steel and aluminum tariffs have resulted in price hikes for equipment we need to produce maple syrup. My company alone was forced to increase prices 10 percent, prices that eventually will be passed down to consumers. We need a fix now before there are long-lasting repercussions on New York’s maple industry,” said Dwayne Hill, Shaver-Hill Maple Farm. posted by Howard B. Owens in Tops Markets, news, business, batavia, Le Roy. Tops Markets today announced it plans to close 10 stores but the neither the Batavia store nor the Le Roy store is on the list. Tops is in the midst of a financial restructuring and a judge overseeing their bankruptcy proceedings will need to approve the closures. The chain's other 159 stores are all expected to remain open but as many as 600 of the company's 14,000 employees are likely to lose their jobs. The company said the 10 stores selected for closure are "underperforming."